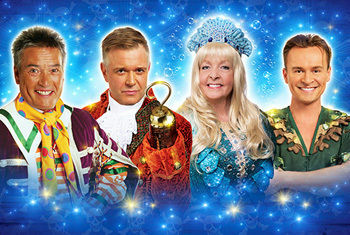 King of Bradford pantomime, Billy Pearce, boards the Jolly Roger and heads to Neverland to star alongside Darren Day in this year’s swashbuckling pantomime adventure. Emmerdale favourite Charlie Hardwick and pop and West End theatre star Jon Lee will also headline alongside Billy and Darren. The Relaxed Performance is aimed at anyone who would benefit from a more relaxed theatre environment including people who are on the autistic spectrum or who have sensory and communication disorders or a learning disability. Everyone booking for the Relaxed Performance will be sent a visual story in advance to help them familiarise themselves with the plot, characters and the setting before they arrive at the theatre. The Relaxed Performance will also include Sign Language Interpretation. To make the pantomime performance as accessible as possible the theatre is offering tickets for this Relaxed Performance for a special reduced rate of £13. These can be booked through the Box Office on 01274 432000 or via the Group Sales Team on 01274 437788, who can advise the best way to accommodate larger groups. Peter Pan will be staged by Qdos Entertainment, the world’s largest pantomime producer, and the company behind the theatre’s record-breaking productions each year. Peter Pan will feature the Alhambra Theatre’s hallmark of outstanding entertainment for theatregoers of all ages. In addition to comedy, music and audience participation, Peter Pan will also feature an exciting 3D sequence which will take audiences deep into the ocean on a magical underwater adventure, and amazing special effects including the biggest crocodile in panto-land.